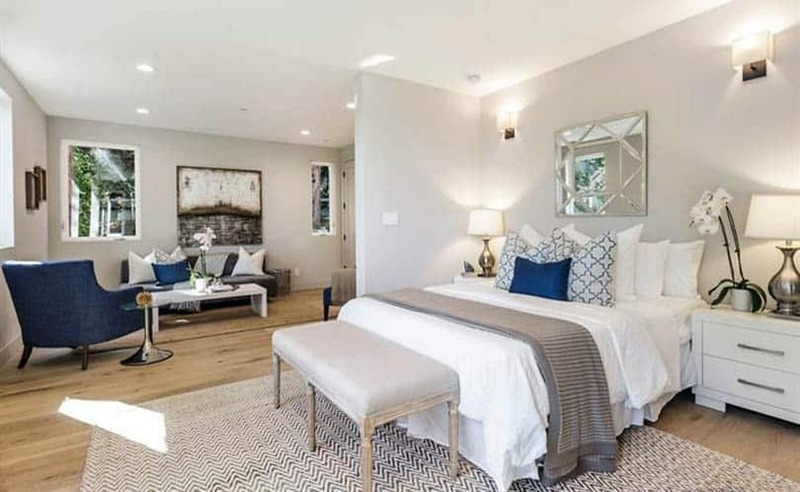 Here we explore a variety of living room bedroom combo interior design ideas including how to get the most out of a multi-use space. Between the small house movement, housing prices rising, and the desire more of us have to live in urban centers, we are living in tighter quarters. And that requires us to rethink our spaces and how we use them. 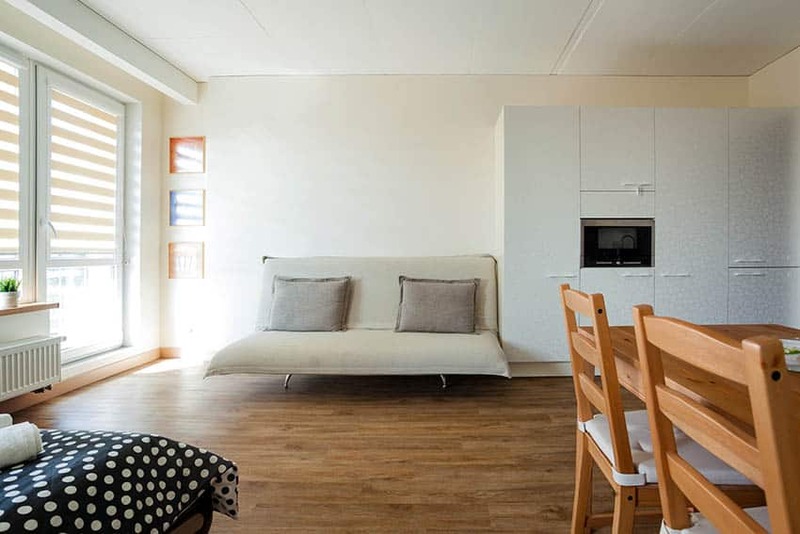 Studio apartment dwellers and college students alike can tell you that the key to having a functional, stylish living and bedroom combo comes down to careful planning, efficient use of space, and an eye for detail. We all know that sofa beds have been a mainstay in these spaces, but there are some fantastic alternatives. Here are some ideas to get you started. An attractive way to split up a living space is by using sliding doors. Whether you live in a studio apartment or just want to maximize your living space, installing sliding doors can give you the ability to quickly get the privacy you need. 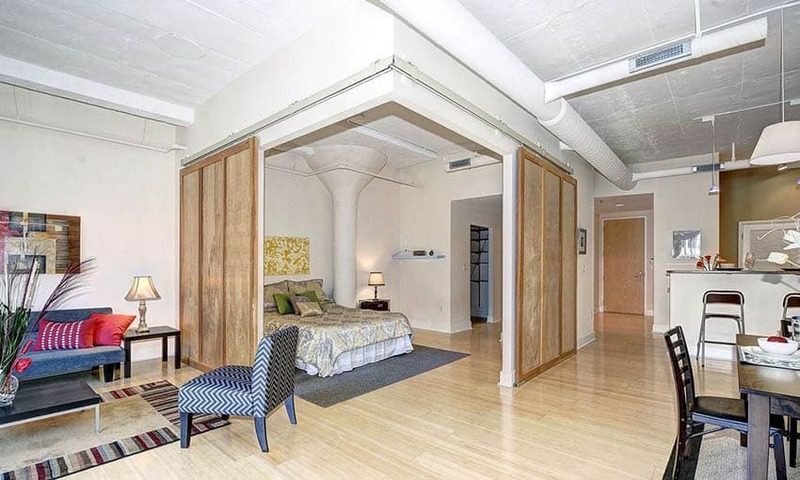 This amazing loft apartment utilizes two types of sliding doors to separate different areas. The living room features sliding doors with frosted glass while the bedroom uses sliding barn doors to create privacy when needed. 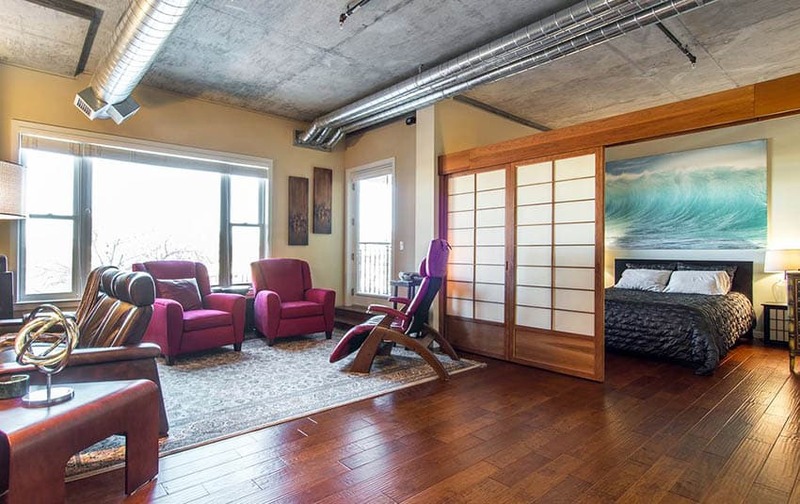 This open concept living room and bedroom design showcases attractive Shoji sliding doors giving the space a Japanese influence. Bamboo flooring through is warm touch and the use of an area rug in the living area really helps to designate and create the feel of a different space. This creative living room and bedroom combo layout uses sliding doors to successfully designate a bedroom area from a normally open design. While framing out this area for doors may be expensive, it could definitely pay off in increased functionality and resale value. Adding a curtain to your living room/ bedroom design could be one of the most inexpensive ways to delineate two different spaces. While not providing as much privacy as a divider, a curtain may be a great choice for those looking to add additional darkness to a sleeping area or to just keep eyes out of your bedroom area. 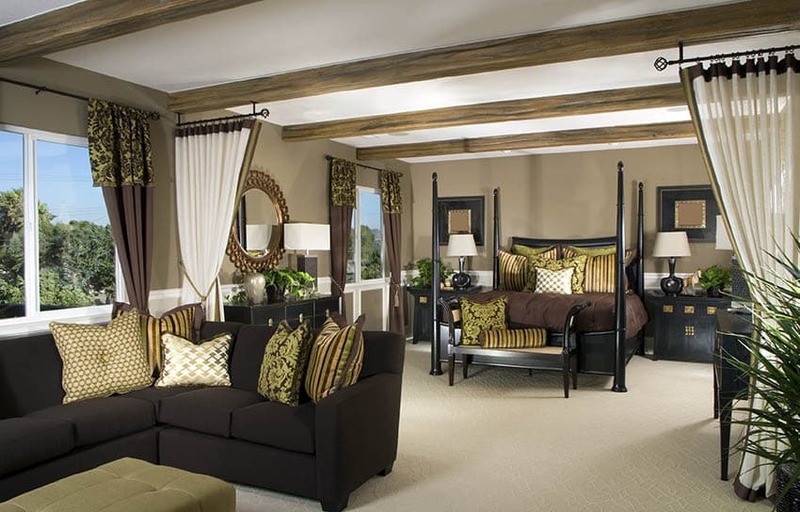 Here’s another example of a n open living room design with a bedroom separated by a curtain. One of the easiest and cheapest ways to create a living room bedroom combo is by using a divider to separate the space. Dividers come in many different styles and portable units can be broken down and stored when not in use. Shoji style dividers are popular and can bring an interesting design style to your interior design. There are many more divider styles to choose from and they are a popular way to turn your living room into a bedroom space for a low cost. This built-in wood slat divider provides a little privacy from the living area in this basement design. 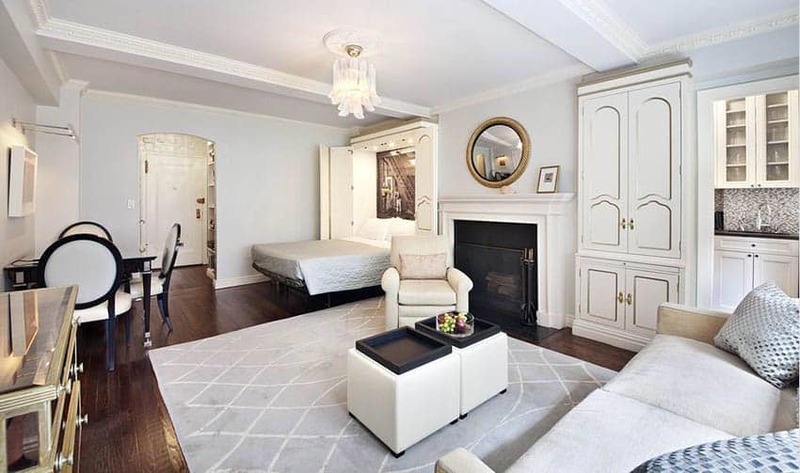 Murphy beds are a great choice for those with limited space. A Murphy bed can be folded away when not in use or quickly opened up when needed. Check out our article about space saving beds for more on the subject. 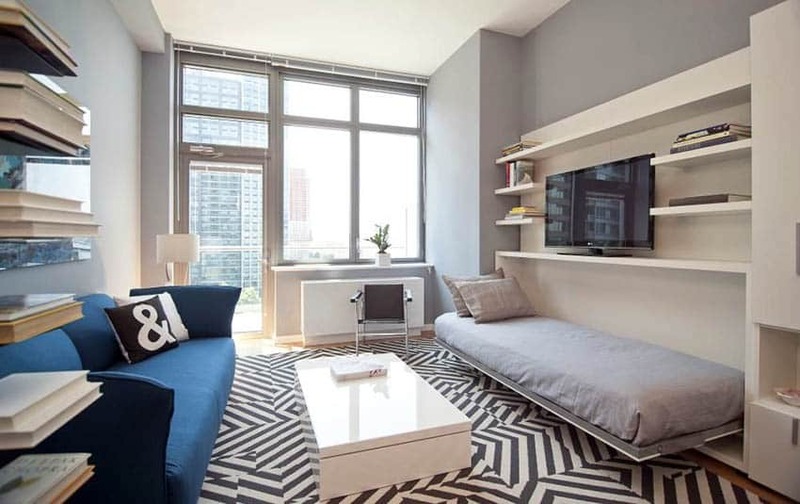 This stylish studio apartment makes use of a twin folding Murphy bed built in to a TV console. Its low profile design is perfect for those with a small layout and who want to maximize their space. 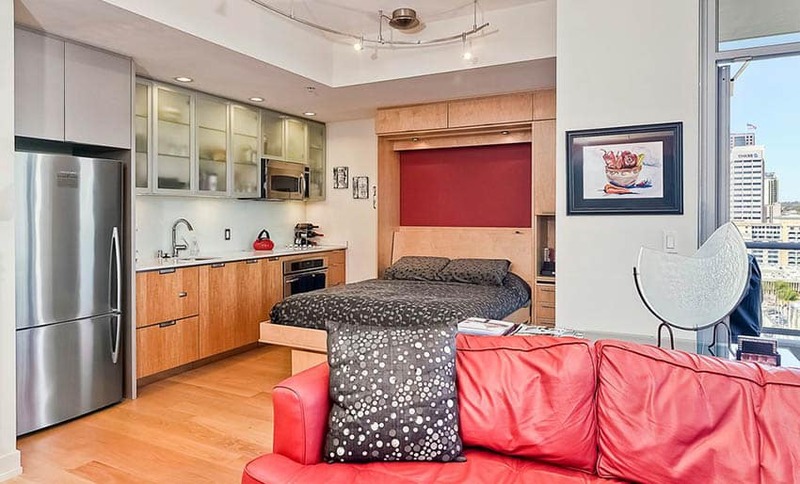 This Murphy bed design open up in the kitchen and faces the main living area. A daybed is versatile and can be a great piece of furniture for a living room and bedroom combination. The daybed can be used to sleep on, or used folded up as a couch. This means you can save money by not having to purchase a sofa as well as a bed. 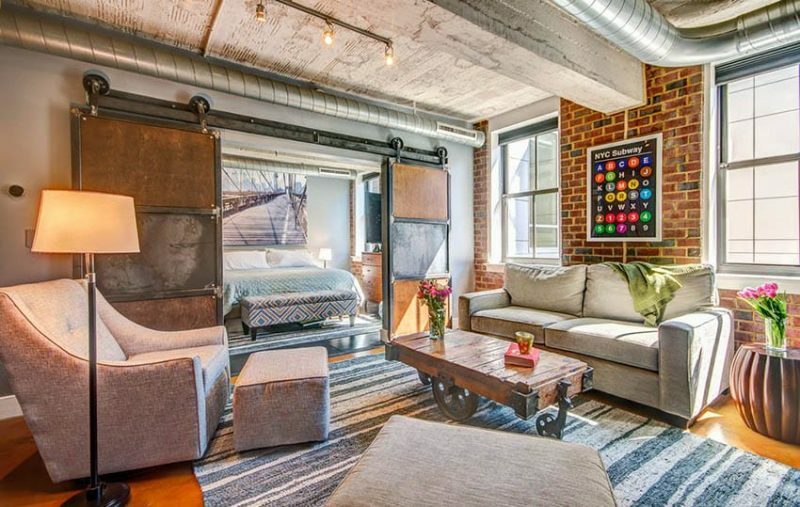 This studio apartment benefits from a futon daybed that looks attractive next to the modern kitchen. This basic metal daybed is adorned with a sheer canopy giving it a whimsical look. 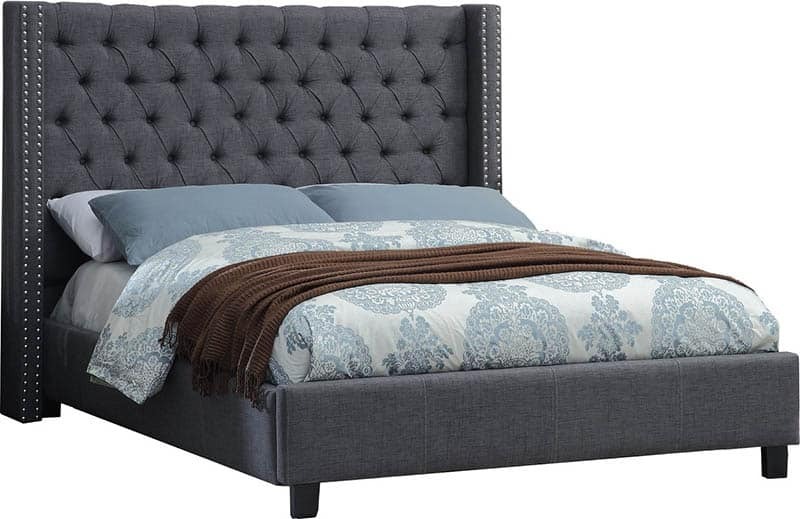 A tufted daybed can bring your own sense of personality to a room. There are a variety of different fabrics sizes, and styles to find the one that suits you. One way to give the illusion of two different spaces is to use an area rug to split them up. without the need for a physical barrier a rug can be positioned under a sofa and coffee table to divide a living space from a bed area. This studio apartment uses a patterned area rug to designate the living space and create a cozy spot for socializing and relaxation. Another way to divide a space is through the use of a storage unit. 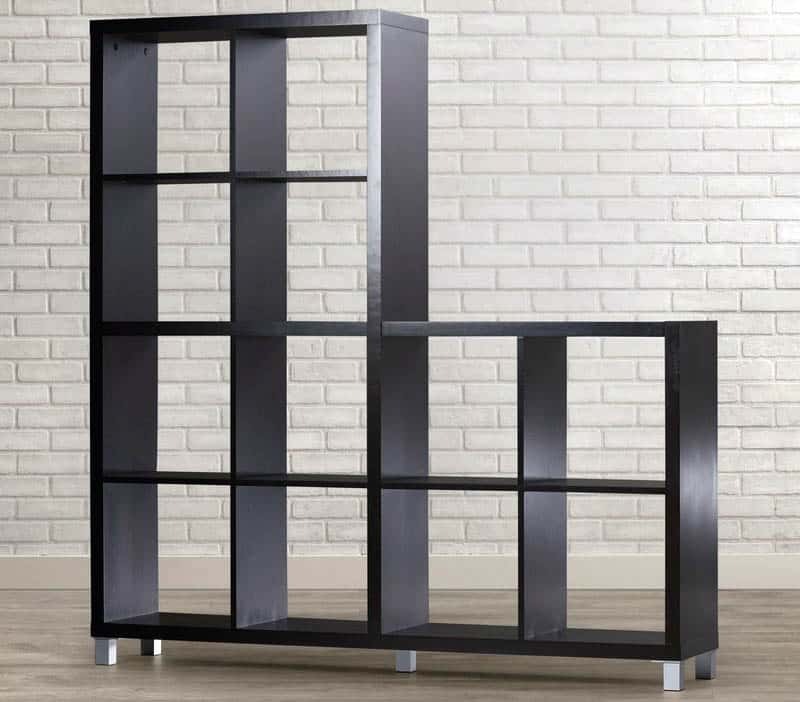 There are many different types of storage one could use from modular, pieces to cube bookcases and more. While not providing tons of privacy a storage unit can act as a wall of sorts to create separation for your layout. When you want your spaces to feel more separate, get creative with furniture. You can use modular storage or a solid unit to create a custom “wall”. The shelving can be open to both sides or you can install cabinets and drawers, creating a solid wall feel. This option not only gives you a focal division between the two spaces, it provides storage and even gives you a place to hang artwork. If you choose an unfinished piece, it is easy to paint, stain, or even wallpaper. If a more modern, clean look is needed, the Dots modular system by ARIS architects is for you. This awesome modular system is made up of pegs arranged in a grid pattern that you can suspend boxes between or just use on their own as hanging rods. This system is truly customizable and creates a super-fresh, clean look. Line an entire wall with them to cover all of your storage needs. 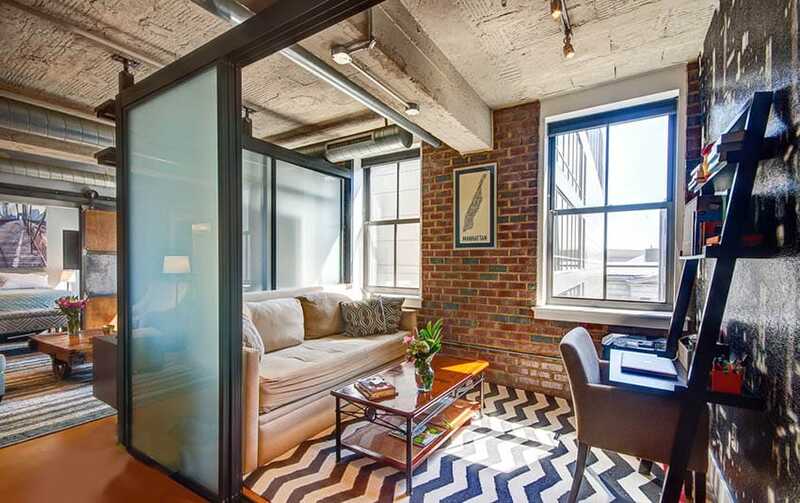 This idea may be a little more for the contractor type, however a partition wall may be just what you need to isolate two areas in a large room. Consider having a wall framed out and built to give you more privacy. You can have niches built into this wall for storage or displaying your favorite pottery. A wall-mounted tv would even work great here. You will lose a few feet of space when you use this option, but what it gives you in efficient storage and privacy more than makes up for a tiny bit of lost space. Another great option for creating a bit of a division between sleeping and entertaining and give a little privacy is to use a bed with a large headboard. The bed can positioned facing away from the living area so those in the living area can look directly at the bed. The larger the headboard the better this method could work. A related option is to use a canopy bed. 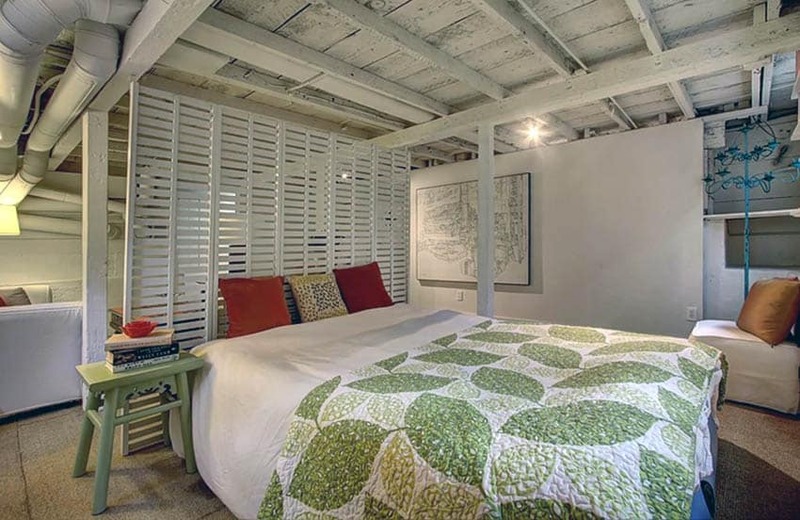 A canopy bed is beautiful won’t cause a lot of visual clutter. Style it with flowing linen or cotton curtain panels and use those same panels to outfit your windows for continuity of design. You could even go with a patterned, more opaque fabric panel at the foot of the bed and place your sofa against it as if it were a wall. Use a high-low coffee table, it can double as a desk when you need to work, and they are available in a vast array of décor styles. 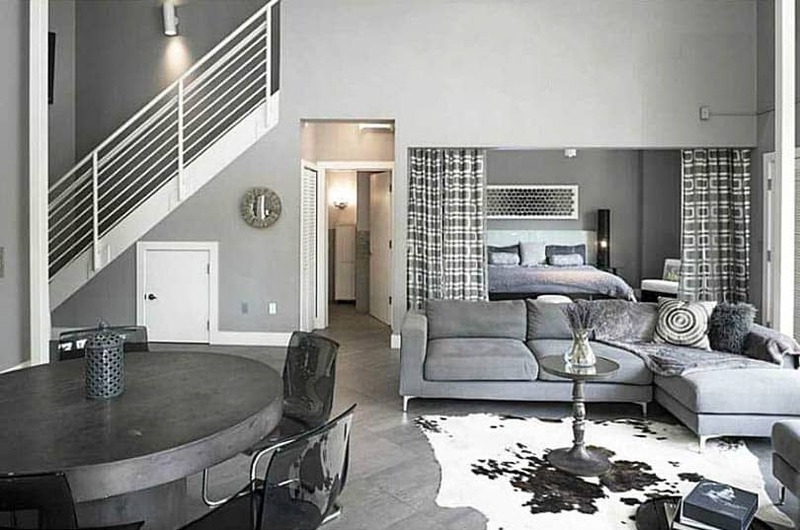 A loft bed could be quite a construction project, however it would be ideal for large rooms with high ceilings. 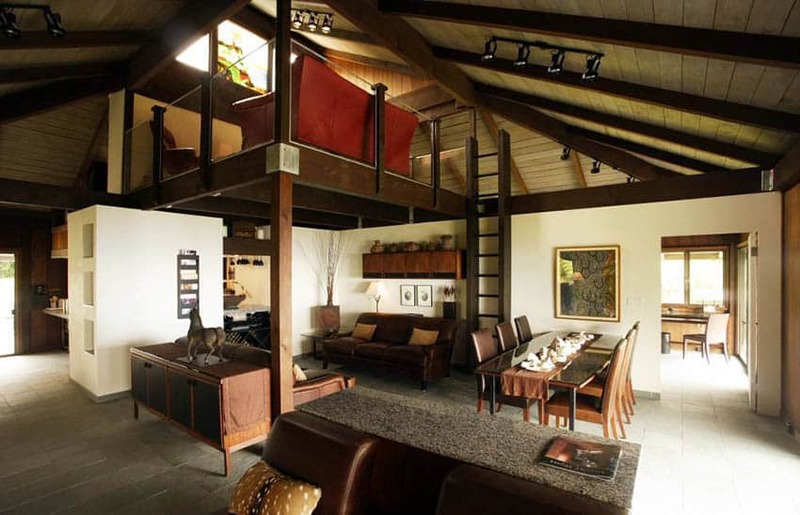 A loft frame could be utilized as a living space or bedroom depending on your preference. This living room features a wood loft area above, accessible via a ladder on the wall. Having a small space means that you need to think outside of the box when looking at ways to use items. There are many budget friendly ways to create separation and still create a livable multi-use space to enjoy. If your room is large enough a sectional couch can be positioned to create separation between a living space and a bed. A tea cart or bar cart does double duty as a classy bedside table and a place to store make-up and other toiletries or items for hobby use. Use the bottom shelf for make-up (or whatever) storage, keeping your items organized in bamboo boxes or fabric baskets, and use the top shelf for a small lamp, a bedtime book, and a pretty little potted plant. Because it is on wheels, you can easily roll this cart to wherever you need it when it comes time to do your make-up, paint your nails, or paint that model car that you’ve had stashed away since you were 9. The Broadbridge Bar Cart from allmodern.com is a fabulous option for a sophisticated bedside or sofa side table. For a more industrial-edge, the metal 9-cubby Thomas Wall Storage from World Market is an easy choice. These cubbies make a perfect place for your extra pillows, blankets and other bed linens, scarves, and even some clothes. And they bridge the gap between living and bedroom because you can also use them as shelving to store video games, board games, and books. Having a bedroom and living room combo is a great way to stretch your creative thinking skills. Make a quick sketch of your space and play around with furniture placement on paper. If you are starting with a blank canvas, use painters tape to outline where you want furnishings to be placed. Just grab the measurements of the furniture that you’d like to use from the internet and place the painters tape on the floor or wall where you want that furniture to go. Spend a few days walking around where the tape is to see how that furniture will impact the traffic patterns in your space. It is a cheap, easy way to test out the size and scale of furniture without having to buy it first. Visit our page featuring living room remodel ideas for a variety of additional ways to transform your living area.